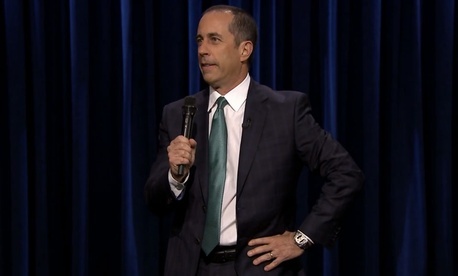 Jerry Seinfeld does not like the United States Postal Service. More than one episode of his classic eponymous sitcom was devoted to mocking the foibles of the postal bureaucracy, and a central character in the series, “Newman,” was a letter carrier whose work was characterized by laziness and ineptitude. In the years since Seinfeld aired, its star’s views of postal operations have apparently not mellowed. Far from it. In fact, during a segment on the Tonight Show Starring Jimmy Fallon this week, Seinfeld was, if anything, more biting than ever when it came to the Postal Service. a dazed and confused distant branch of the Cub Scouts, bumbling around the streets in embarrassing shorts and jackets with meaningless patches and victory medals, driving 4 miles an hour 20 feet at a time on the wrong side of a mentally handicapped Jeep. I love how the postal system has this financial emotional meltdown every three to five years that their business model from 1630 isn’t working any more. I can’t understand how a 21st century information system based on licking, walking and a random number of pennies is struggling to compete. Previous Post | Have Feds Been Off the Job 25 Percent of the Time This Fiscal Year? Next Post | Hey Federal Techies -- Make Your Voice Heard!